Enjoy Utah! : Spring Running in Utah Valley! Spring Running in Utah Valley! We are keeping you honest here at the CVB. There is no excuses for not signing up for a 5k/race this Spring (if you can walk or job). Enjoy this weather and get out there! 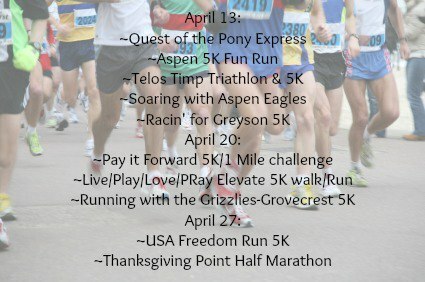 Find more information on all of these great events at: UtahValley.com.